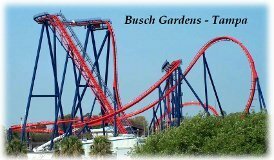 Citrus County and Sugarmill Woods Area Attractions. Sugarmill Woods in Citrus County Florida is centrally located between Gainesville, Orlando, and Tampa. This offers quick access to major metropolitan areas and all they have to offer. 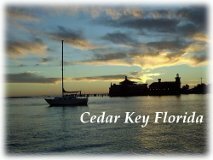 About two hours to the north is Cedar Key, a quiet island community nestled among many tiny keys on the Gulf Coast of Florida. Long admired for its natural beauty and abundant supply of seafood, it is a tranquil village, rich with the almost forgotten history of old Florida. Many quaint bed and breakfast accommodations are available as well as a small beach. Also to the north, but closer to home is the city of Ocala. Famous for its race horses and equestrian flavor, Ocala offers upscale shopping, the Paddock Mall, and many small antique shops and boutiques. You can also attend the Central Florida Orchestra concerts, the Appleton Museum, Silver Springs attraction with its crystal clear springs, glass bottom boat rides and the Wild Waters amusement park, as well as the many restaurants on State Route 200. There is also a large campus at the College of Central Florida. 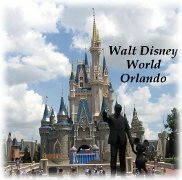 Two hours to the east is Orlando Florida and all that it has to offer; Disney World, Epcot Center, Downtown Disney, Animal Kingdom, Universal Studios, MGM Studios, Seaworld, and countless resorts and other attractions. A little further east is the Kennedy Space Center. Just 90 miles to the south is Tampa, Tampa Bay and St. Petersburg beyond that. The Tampa Bay area offers endless opportunities to experience the city on the bay. In Tampa, a single day's itinerary might include breakfast at a waterside cafe, a visit to Busch Gardens Africa, The Florida Aquarium, a streetcar ride to Channelside for shopping, a Tampa Bay Buccaneers, Tampa Bay Rays, or Lightning game, topped off with a stay in one of the luxury hotels or resorts. Tampa is also home to many world renowned museums. Then on to historic Ybor City where the Cuban sandwiches are hot and crisp, the cigars are hand-rolled, and the colorful streets are lined with fun. Or enjoy the white, sugar sand beaches, sport fishing, jet skiing, para-sailing, and join the party in January as rowdy swashbucklers invade Tampa Bay for the Annual Gasparilla Pirate Festival. A little closer to the south is an attraction you won't find anywhere else on earth. If you thought mermaids were just the lively imaginings of lonely sailors, think again -- and come to Weeki Wachee Springs, the City of Live Mermaids, on the Gulf Coast of Florida. Located about an hour north of Tampa at the crossroads of U.S. 19 and State Road 50, a half hour south of Sugarmill Woods. Weeki Wachee is an enchanted spring -- the only one of its kind in the world -- and one of Florida's oldest and most unique roadside attractions. For almost 60 years, the fun, family oriented park has lured in visitors with beautiful mermaids who swim in the cool, clear spring waters. Weeki Wachee Springs is a magical entrance into a mysterious blue underwater world of mermaids, manatees, turtles and bubbles. Sitting in the Mermaid Theater, visitors feel like they are inside the flowing spring, and are transported back to simpler times, before super theme parks and super highways appeared. 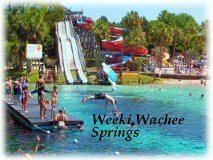 The Seminole Indians named the spring "Weeki Wachee," which means "little spring" or "winding river." The spring is so deep that the bottom has never been found. Each day, more than 117 million gallons of clear, fresh 72-degree water bubbles up out of subterranean caverns. Deep in the spring, the surge of the current is so strong that it can knock a scuba diver's mask off. The basin of the spring is 100 feet wide with limestone sides and there, where the mermaids swim, 16 to 20 feet below the surface, the current runs a strong five miles an hour. Even closer to home, right in Citrus County is Fort Island Trail Beach. Citrus County's only saltwater gulf beach. This is a thousand foot beach with picnic facilities and concessions. Lifeguards are on duty from Memorial Day through Labor Day. A public boat ramp, dock and boardwalk are available. 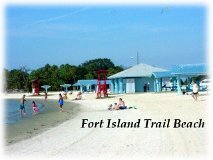 The beach is approximately 9 miles out at the end of Fort Island Trail in Crystal River and is a free facility. Citrus County also has two non-commercial airports, one in Inverness and the larger one in Crystal River. 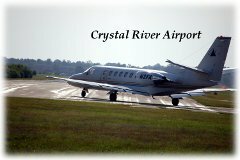 The Crystal River Airport is located on a 196 acre site three miles south of downtown Crystal River. The airport has two non-intersecting runways and a large general aviation terminal building with approximately 20 parking spaces for automobiles. The aircraft ramp can accommodate 53 aircraft.